I suppose it’s testament to Payday’s appropriation of Dead Presidents chic that no other gun game can do masks without running the idea by Overkill first. Character models in Counter-Strike: Global Offensive, one of the great PC first-person shooters, have been temporarily jujjed up with fancy dress disguises – some of which come courtesy of Team Fortress and Payday 2. “For too long the chickens of CS:GO have idly watched as their brethren were slaughtered by the droves,” warn the CS dev team. 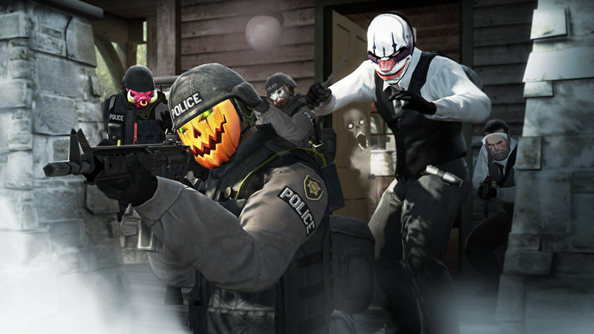 If you should find yourself at the wrong end of murder most fowl, you’ll discover another of CS:GO’s Halloween features: players who float about using their death cameras will show up under the gaze of fellow death and freeze cameras. You can expect the changes to last at least until the end of the month -unless you choose to turn holiday mode off for your server. And this weekend, top CS players will compete for a $50,000 prize pool at the FaceIT LAN finals. Hopefully the sport can leave the ALSEN match fixing fiasco behind it. Whether or not the chickens will interfere with the pros remains to be seen. Do you think you’ll log into the second-most popular Steam game to see the silliness first-hand?